It is a stabilizer which constantly monitors the output voltage and controls the variations in the input voltage by movements of a motor. This motor in turn selects the proper output voltage on the variable transformer. It gives reasonably good voltage regulation and is all right where voltage fluctuations are not taken into consideration. This is probably the lowest priced, power controlling product and is available in the market. It is essential for use in sophisticated electrical/electronic equipments to protect from Voltage variations. ► It act as a guard for every electronics equipments ► Quick, steady and accurate correction of voltage output 230V for Single phase and 400V for Three phase. ► ISO 9001- 2019 quality certifications ► Despite load current variations - Balanced output voltage. ► Irrespective of input imbalance. ► Fully automatic. ► Reduces heating and minimizes losses. ► Over Load Protection. ► Constant temperature maintained by oil or air cooling system.► Boost-up transformer based model.► Digital display for input and out put volt & irregularities. ► By using servo stabilizer we can improve over all production quantity and quality. ► In medical field, it is must for getting accurate lab test results.► Overall energy saving - above 98% efficiency Increased life of your equipment. ► Compact in size, etc. 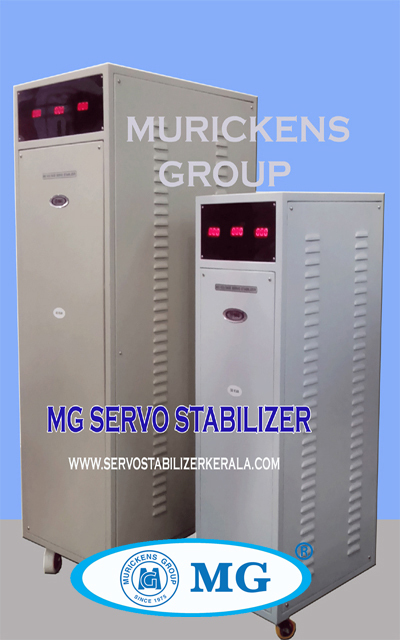 ► Custom made servo voltage stabilizers available as per customers requirement.► Some of the extra adoptable features are Bypass Mechanism ( change over switch ) Inbuilt Isolation Transformer, Time Delay, Wheel mounting. Typical Applications :- Which is commonly used in places where controlled and constant Voltage is required, like Hospitals, Laboratories, various Life Saving & testing equipments, pharmaceuticals, Research Institutes, Data Processing Units, Food Processing Units, Offices and Residences/ Apartments etc. Available in the range of .5 KVA to 95 KVA.